Justin Haley, driver of the #24 Zeality Chevrolet, leads the field to the green flag to start the NASCAR Camping World Truck Series JAG Metals 350 Driving Hurricane Harvey Relief at Texas Motor Speedway on November 3, 2017 in Fort Worth, Texas. Photo by Sarah Crabill/Getty Images for Texas Motor Speedway. 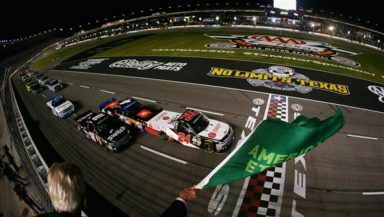 The NASCAR Camping World Truck Series continues their Round of 6 playoff run in the Lone Star State in Fort Worth, Texas for the annual running of the Jags Metals 350. Three spots are still up for grabs in the Championship 4 and five drivers have just two more chances. There is a great chance of another driver locking himself into the Championship 4 race at Homestead Miami. Here’s a look at who could punch their way into victory lane Friday night at Texas Motor Speedway. Currently, there are 35 trucks entered on the preliminary entry list. There are also some familiar faces in different rides. These include Reed Sorenson in the 49, Baley Currey in the 83, Bo LeMastus in the 54, Parker Kligerman in the 35, Timmy Hill in the 87, David Gilliland in the 17, Corey Roper in the 04, Mike Harmon in the 15, Reid Wilson in the 7, Codie Rohrbaugh in the 9, Tyler Young in the 12, Camden Murphy in the 0, and Ross Chastain in the 38. 1. Johnny Sauter – It’s hard to beat a man who is just on a roll this year in the Truck Series. That person just happens to be six-time winner and 2016 champion, Johnny Sauter. In the last five fall races, he has won twice, finished 13th in 2015, 16th in 2014, and second in 2013. The 2016 race saw him advance to the Championship 4, and he ultimately won the championship that year. Last fall Sauter finished second and ninth respectively and led 21 laps. He finished fifth here in the spring race. Sauter has won at Texas overall five times giving him 20 starts, 10 top five and 16 top 10 finishes, with 360 laps led, an average start of 8.0 and an average finish of 6.0. He’ll be tough to beat as he a man on a mission looking to collect his second championship. 2. Matt Crafton – It’s hard to believe that the two-time champ does not have a win this year and he could go winless. However, much more is on the line than just a win – a spot in the Championship 4. Crafton is currently 10 points below the cutline, but this weekend could be the site for his first win of the season. He has a best finish of second that came in the fall of 2016. In the previous fall race, Crafton finished ninth after finishing sixth and eighth, respectively, in both stages. Overall, he has 35 starts with two wins, 429 laps led, 14 top fives and 24 top 10 finishes, giving him three DNF’s and an average start of 12.5 with an average finish of 9.1. In the spring race, Crafton finished fifth after placing second and 10th in both stages. This weekend could be the site where Crafton once again locks himself into the Championship 4 at Homestead and looks to be a three-time champion. 3. Stewart Friesen – Friesen only has one start in the fall race which came last year where he finished 14th. In the spring race, Friesen finished third after winning Stage 1 and finishing second in Stage 2 but came up short of winning. Overall in his career, he has just three starts with 13 laps led, one top five and one top 10 finish, giving him an average start of 11.7 and an average finish of 12.7. He might be out of the playoffs, but that doesn’t mean it stops Friesen from winning. Look for Friesen to be a strong contender Friday night. 4. Grant Enfinger – Like Crafton, Enfinger is on the bubble with just two points to the good. He’ll need two more good runs if he wants a shot at the championship. He has three overall starts with eight laps led, two top fives and three top 10 finishes. This gives Enfinger an average start of 10.7 and an average finish of 4.7. He has just one fall start that came last year where he finished seventh and led one lap. In the spring race, Enfinger finished fourth after he won Stage 2. 5. Justin Haley – Haley could be the next GMS truck driver that makes the Championship 4. He has three overall starts that gave him 28 laps led, two top fives and three top 10 finishes. This gives Haley an average start of 7.0 and an average finish of 4.7. He won the pole last fall and wound up fifth. The spring race saw Haley third on the scoring pylon. Other notables and stats – Johnny Sauter has won five times at Texas. If he wins this weekend, Sauter will tie Todd Bodine who has six wins at the 1.5-mile track in Fort Worth. Brendan Gaughan is the only one to have won four in a row. Ron Hornaday is a three-time winner. Since 1997, the Truck Series has competed at Texas Motor Speedway 41 times with just 19 fall races. Jay Sauter won the first fall race in October 1999. Five drivers have won from the pole with the last time in 2007 by Todd Bodine. The lowest a race winner has come from to win was 22nd in 2004, also set by Bodine. The truckers get on track Thursday afternoon with the first practice slated for 4:05 p.m. ET and the final practice scheduled for 6:05 p.m. ET. Qualifying takes place Friday afternoon at 4:10 p.m. ET and will be televised on Fox Sports 2. The JAGS Metal 350 race coverage begins at 8:30 p.m. ET on Fox Sports 1 and MRN Radio with stages of 35/70/147 laps.